The FOMC continues to insist that the Fed Funds Target rate rather than the reverse repo program (see discussion) will play a central role in the upcoming rate normalization. Let's revisit the concept of the Fed Funds arbitrage (discussed in item 4 here) to show why that's a problem. The Fed Funds rate (currently at about 9bp) is determined by the overnight interbank lending market in which banks provide liquidity to each other. The market has shrunk dramatically since the financial crisis (see post), with the activity now limited to a few players with specific needs. US federal home-loan banks (FHLBanks) who, unlike commercial banks, do not receive interest on excess reserves at the Fed are the largest participants. In order to earn any interest at all on their excess liquidity they lend it to a handful of banks that use the funds for arbitrage. In particular foreign banks operating in the US have been active in this game, which nets them around 16bp in riskless profits. It's easier for foreign banks to engage in this activity because many do not take in US deposits and therefore are not subject to FDIC fees. 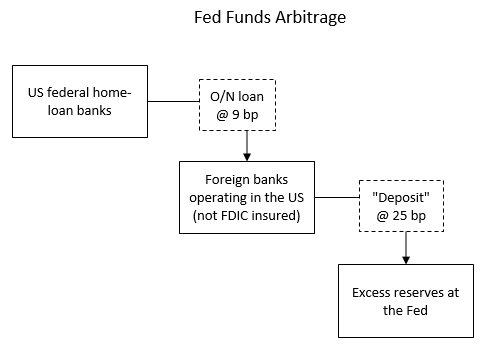 Because Fed Funds arbitrage involves increasing the balance sheet (and leverage) of the borrowing bank, US depositary institutions engaging in this are subject to higher FDIC fees. Foreign institutions on the other hand may not be as concerned about this. Bloomberg: - The situation is complicated further by the reluctance of domestic banks to engage in arbitrage in the fed funds market, because Federal Deposit Insurance Corporation insurance fees increase proportionally with bank leverage, reducing the profitability of the trades. “The only people that are really arbitraging at the moment would be the foreign banks without domestic deposits that need to get insured,” said David Keeble, head of fixed income strategy at Credit Agricole in New York. “Ultimately, you're allowing the arbitrage to continue and giving money” to foreign banks rather than domestic ones, he said. Let's put this another way. The Fed is paying foreign institutions to participate in this market and bank federal home-loan banks' overnight liquidity. Moreover, as regulation of foreign banking institutions in the US tightens, even these banks may decide to walk away from this strategy. The Fed may have to juice up the spread between the Fed Funds rate and the interest it pays on excess reserves (IOER) in order to keep these banks participating (the current 16bp of riskless profits may not be enough). Note that this "encouragement" comes at taxpayers' expense because it raises the Fed's effective funding rate, reducing the amount the Fed remits to the US Treasury. Bloomberg: - To help keep that market alive, the Fed will have to pay those banks a premium to continue trading in it, which will eat into the profits the central bank remits to the U.S. government each year. And even then, foreign banks may be unwilling to continue their trades as stricter regulations on leverage take effect. The whole policy of targeting the Fed Funds rate now depends on a handful of foreign banks' willingness to participate in this game - just as we approach the first rate hike in years. Is this really the Fed's best monetary policy tool going forward?